I watched some of the footage of Congressman Issa's questioning Holder. Heh, Issa could spit nails because Holder was playing dumb, repeating the question fully as if he didn't understand, etc. Just wasting time. The most frustrating thing is that this ferret would break on the way down to the basement. I can hear the gushing now. Just another "step and fetch it" Federal Employee promoted way above his intelligence and usefulness level. I have personally seen this too many times. Deny, deny, and try to control the dialog. Why do they do it? Because it works. 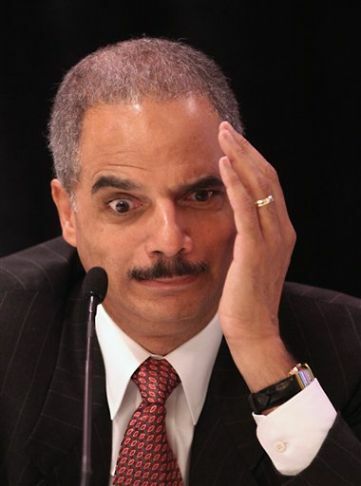 Eric Holder, and his down-line at the DOJ, don’t need to be held in *contempt* OF Congress. I have a great deal of contempt FOR Congress, and they are, Congress that is, in most cases, quite contemptible. Lets cut through the BS and call this like it needs to be called, Fast and Furious was a contemptible action, but Eric Holder and Company need to be charged as accessories to Capital Murder in the death of Agent Brian Terry. Do you want to know WHY Holder is NOT already in jail? Everyone is too afraid to blast off on him because he is BLACK. That’s it, nothing more. This entire nation dwells on Political Correctness and is afraid of being called RACIST! Well, most of the nation that is. I can take the heat, I get called a racist on an almost daily basis, and you know, I sleep quite well at night. The Race Card is the biggest freaking joke ever, and one that scares more writers and bloggers than anything else. Cowards, one and all. HAMMER ERIC HOLDER, no free passes because he’s Black, WRONG is WRONG. It makes NO difference what color skin that sorry SOB has. There is a segment of this population that is going to call you a RACIST no matter what you say, no matter how you say it, as long as YOU are White and espouse an opinion about a BLACK criminal, YOU are a racist! When I didn’t mourn the recent death of a *hood-rat* that was trying his best to become a *Cop Killer*, I was a racist! So, it matters little what we say or do, we are RACISTS. Calling for Eric Holder to be hammered makes me a racist, not supporting Barack Hussein Obama makes me a racist, at least in the eyes of Dems, Libbers, Welfare Slugs, reparations and entitlement believers and ‘hood-rats, so, I might as well go ALL OUT and take the Obama Regime to task and try my very best to get Eric Holder removed ASAP and sent to prison! He knows if he can BS for 5 minutes he doesn't have to answer the question. He doesn't do it when the demoncraps ask. Not hard to figure out what he's doing. ∞ ≠ ø, it was amusing, was it not? MrC: me too; we all have someone like an Eric Holder in our workplaces. TF, in Holder's case, yes, it's the issue of melanin! Dakota5: first, thanks for visiting and thanks for taking the time to comment. He does it because he realizes the press corps is in the bag for he and the Obama admin. He does it because he can and because there are no consequences. Deny, obfuscate, blame others, fail to answer... sigh... Typical of this adminstration! There is no doubt Holder is "playing Stupid". Holder needs to be interrogated by The Mexican Military;they are taking KIA's daily by the weapons Holder allowed to walk into Mexico. I would believe, a confession would be forth coming in short order. Great Post as usual.